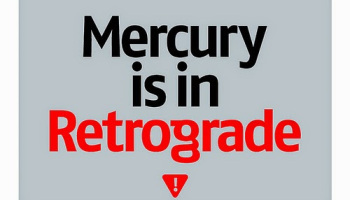 What does ‘Mercury’s in Retrograde’ actually mean? You might’ve heard someone reference Mercury in retrograde while complaining about something wrong in their life. But what exactly does that phrase mean really? Astrologers believe that this planetary goofiness throws off earthly communications and connectivity. For example: “Your car or printer stops working,” says Laura Gilmore, the New York City astrologist known as Astrobabe. “Something new you’ve bought doesn’t quite work out and you can’t get in touch via phone, text, or even snail mail with people you normally would be able to in a snap.” Astrobabe says she’s also noticed that romances that begin in retrograde generally don’t tend to go very smoothly. “So it might be good to wait until Mercury goes direct to get serious with that sweetheart,” she says. But it’s not all bad—if you’ve been looking for an excuse to slow down and regroup, this might be it, says Astrobabe. “You should consider it as time to go back and review, research, rework, and remind,” she says. “Car, computer, and phone all working OK?” If there’s anyone you need to get in touch with or something you need to sign, try to do it before the next retrograde period begins, she says. The bottom line: Unfortunately, Piercey says there’s little concrete science to suggest that Mercury’s motions actually have any effect on the affairs of earthlings (despite all the anecdotal evidence). But, hey, if nothing else, it’s a reminder to back up your iPhone and not take unanswered texts personally.